Lying dormant deep within the Frost Province Glacial travels through caves deep beneath the earth, feasting on ancient glaciers. 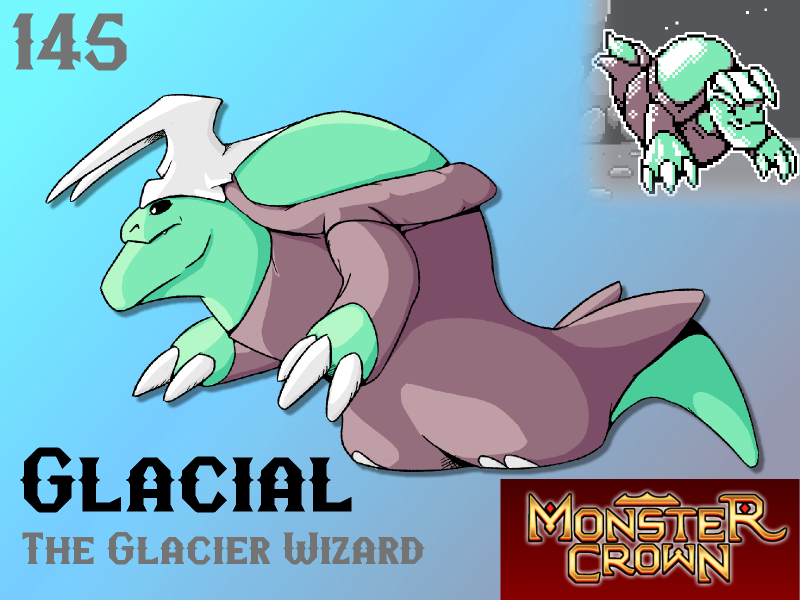 As Glacial consumes more and more of the Glacier its body reaches ever lower temperatures, granting it immense magical powers. Glacial is able to lash out with powerful icy magic effortlessly, freezing caverns closed at the first sign of an intruder. The intruder, now trapped, will experience rapidly dropping temperatures until they either freeze to death, or are found by Glacial. While this Monster is spoken of only in tamer circles - and even then with skepticism - it is believed by some to be the reason for Stamlanche's chronic anxiety and tendency to travel in groups. Will Glacial make your team? He does have quite a chin, and quite poor posture!